The Retrospect Framework by Bas Rieter is licensed under a Creative Commons Attribution-Non-Commercial-No Derivative Works 3.0 Unported License. Files that belong to the Retrospect Framework have a disclaimer stating that they are licensed under the Creative Commons Attribution-Non-Commercial-No Derivative Works 3.0 Unported License. All channels, skins and config.py (further called Retrospect Additions) are free software: you can redistribute it and/or modify it under the terms of the GNU General Public License version 3 as published by the Free Software Foundation. Retrospect Additions are distributed in the hope that it will be useful, but WITHOUT ANY WARRANTY; without even the implied warranty of MERCHANTABILITY or FITNESS FOR A PARTICULAR PURPOSE. See the GNU General Public License for more details. You should have received a copy of the GNU General Public License along with Retrospect Additions. If not, see . Kodi Add-on packages containing modified code must be given a different add-on identification to prevent confusion with the official packages. The official add-on packages that are currently available from the official BitBucket page and may not be distributed via other channels or included in other repositories. Retrospect has a public GIT repository at Bitbucket. Other Bitbucket user can fork this repository and use it to create a copy of the Retrospect code. However, as specified by the license above, it is not allowed to distribute modified Retrospect Framework code. 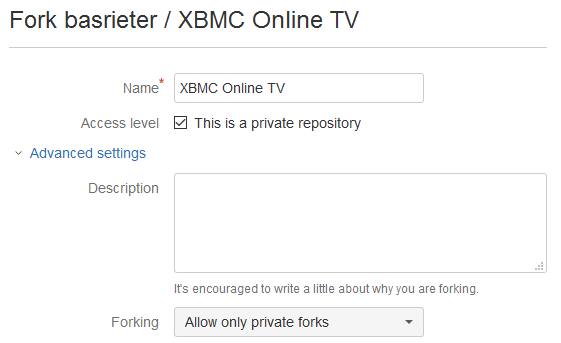 So those that fork the Retrospect repository should make it a private repository in order to be in compliance with the license. 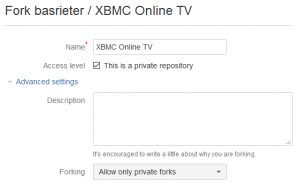 Forking the Retrospect Repository and setting it to be a private repository. Why two licenses? When I started out Retrospect I had a clear view in mind: creating a single framework which could be used for viewing online streams of video files. The basic idea was that there would be a single framework and a lot of channels. The latter could be contributed by other users. The framework should be central: one framework, not multiple frameworks. Everybody is free to use the framework, but the development happens at one place. That is, in my opinion, the only way to keep a good working application. Everybody is free to contribute but there is one place where people decide what to put in the framework and what not. Recent events (Jan-2009) have led to a situation in which more Retrospect builds/branches appeared. Not really a problem, it is nice to see people use my work. I don’t even mind them making modifications to the framework. What was a problem is that those builds did used this website and the google-code website to check for updates, eventhough they did not use the framework that I provide. So they checked for my updates for there modified framework? So when I update Retrospect they get a notification, download the original version and that one breaks their channels, because it does not have their modifications. Then those people will come and complain with me! Besides this, sometimes they did not even bother changing the name so it seemed like it was the same script, but it wasn’t. And even worse, the readme.txt was not rewriten, so it appeared that people who generously donated to Retrospect, also donated to the other projects. Especially the latter is not acceptable for me. That is why I decided to officially split Retrospect in two parts with each it’s own license starting from version v3.2.0b3. The Retrospect Framework will be licensed by the CC BY-NC-ND license which allows people to use it freely, but not modify it without my explicit OK. The other part, all channels, skins and the config.py file are licensed under the GPL v3 license. This way everyone can use or modify that code according the license. Retrospect and/or Rieter.net are not connected to or in any other way affiliated with Kodi, Team Kodi, or the Kodi Foundation. Furthermore, any software, addons, or products offered by Retrospect and/or Rieter.net will receive no support in official Kodi channels, including the Kodi forums and various social networks. Retrospect and/or Rieter.net are not responsible for any content that is displayed using the Retrospect Framework. Retrospect and/or Rieter.net do not support any kind of adult or illegal content for the Retrospect Framework, nor will we host it on our servers.